Different types of rattlesnakes live in cold-weather environments. They survive at low and high elevations where snow and freezing temperatures exist seasonally. The reptiles utilize behavior adaptations to survive where many other snakes and reptiles cannot. All rattlesnakes are cold blooded and require an external heat source, rather than their internal metabolism to regulate body temperature. They do best in temperatures between 70 and 90 degrees Fahrenheit, and must retreat from hot- or cold-temperature extremes to survive. Rattlesnakes cannot survive in cold weather without a heat source and a slowed metabolism. Exposure to the elements would kill the snakes. Rattlesnakes locate dens in rock outcroppings to find shelter. They enter the dens as groups and gradually slow their metabolism and activity as the weather cools. The snakes enter a state of hibernation until the weather warms and provides enough heat for survival outside of the den. Cold-weather snakes are common throughout North America. The snakes live in the Sierra Nevada Mountains and the Rocky Mountains. 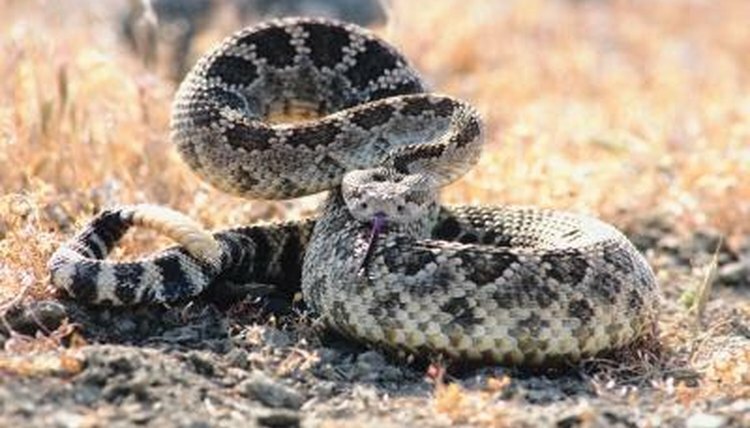 Rattlesnakes are especially common in high-desert environments where long summers are followed by short, harsh winters. The timber rattlesnake and diamondback varieties are both common in regions with cold winters. Although rattlesnakes live in cold-weather environments, they are not a threat to humans or domestic animals during the cold months. The snakes hide below ground and hibernate. They are a concern during the late spring and summer when the earth is warm enough for regular feeding. The snakes bask on rocks and roads and they are sometimes found near trails where there aggressive nature can put humans and animals at risk. Rattlesnake winter dens are often located on exposed south-facing slopes with rocks that form natural dens beneath the ground. The rocks absorb heat and the slopes are the warmest zones available in cold regions. This increases the comfort and survivability odds for the snakes. The areas also attract rodents that provide an immediate food supply after hibernation. Snakes are also known to den under residential houses.